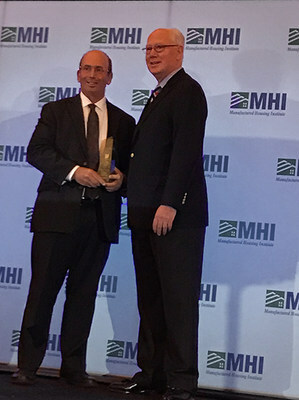 FREEHOLD, N.J., May 3, 2017 /PRNewswire/ -- UMH Properties, Inc. (NYSE: UMH) is pleased to announce that on May 2, 2017, Port Royal Village won the Manufactured Housing Institute's Land-Lease Community of the Year Award for the Northeast/Mid-Atlantic region. Port Royal Village is an all-age community located in Belle Vernon, Pennsylvania. It contains 465 developed homesites situated on approximately 101 acres. UMH is proud to receive this award as it showcases our dedication to providing quality affordable housing at each of our 106 locations. Samuel A. Landy, President and Chief Executive Officer, commented, "Port Royal Village is a beautiful community located just forty-five minutes south of Pittsburgh. The residents here enjoy a high-quality community with many amenities and scenic views. This community will continue to benefit from the growing Marcellus and Utica shale industries." UMH Properties, Inc., which was organized in 1968, is a public equity REIT that owns and operates 106 manufactured home communities containing approximately 19,300 developed homesites. These communities are located in New Jersey, New York, Ohio, Pennsylvania, Tennessee, Indiana and Michigan. In addition, the Company owns a portfolio of REIT securities.